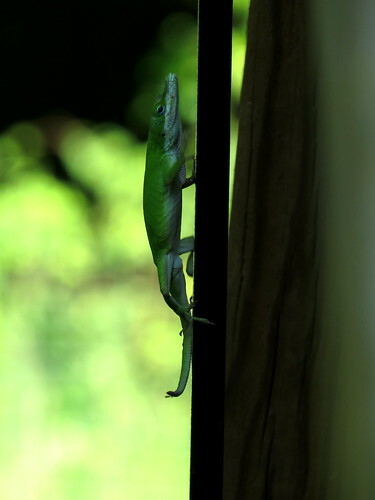 One of my favorite animals that lives in North Carolina is the green anole. 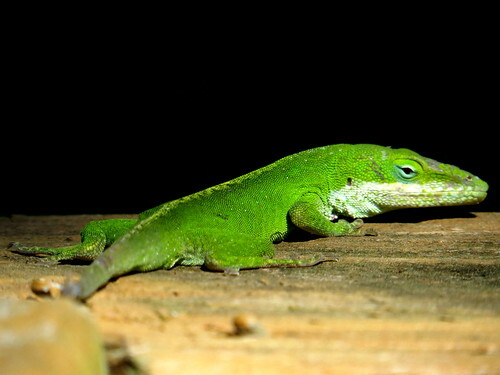 I didn't realize until today that the anole is the only species of lizard native to North Carolina. We have one that lives on our back porch. Our hummingbird feeder has a plastic moat we fill with water to keep ants out of the feeder and the anole has been using it as his personal water dish, which is fine because I think he is also eating any ants who show an interest in the feeder. We haven't named him yet but we have tossed a few names around. I really enjoy watching him scamper around the deck, doing his territorial-claiming push ups and inflating his red dewlap, the skin beneath his throat. Here are a couple of pictures of our new friend.